Capitol Peak is located outside of Aspen. 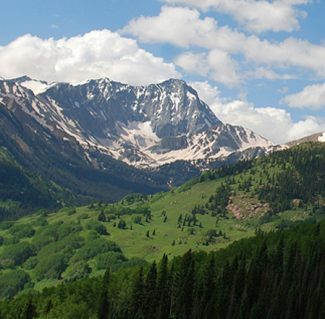 Two climbers from Aspen were found dead Tuesday near the summit. The bodies of an Aspen couple missing since Sunday were found Tuesday afternoon at the base of the north face of Capitol Peak, an official said. A helicopter search crew spotted the bodies of Ryan Marcil and Carlin Brightwell about 2:25 p.m. Tuesday, said Jesse Steindler, a commander with the Pitkin County Sheriff’s Office. The two were recovered from the mountain and arrived at the airport just before 6 p.m., he said. The couple, who were in their mid- to late-20s, had been dating for about six or seven months, were in love and had moved in together, friends said Tuesday. Brightwell worked at Aspen Emporium and Flying Circus on Main Street for about two years and Marcil was working in Aspen for his family’s Florida-based business, friends said. He also served on the board of Aspen Strong, a local mental health advocacy group. Families of the victims were arriving in Aspen on Tuesday evening, Steindler said. The deaths are the third and fourth this summer on the treacherous 14,130-foot peak located west of Aspen. Numerous reports about the missing couple, who friends said hiked to a high camp Saturday afternoon and planned to climb the peak Sunday, were posted on Facebook and 14ers.com on Tuesday. Some speculated that they might have camped an extra night to witness Monday’s solar eclipse. Volunteers from Mountain Rescue Aspen began searching for Marcil and Brightwell at 7:55 a.m. Tuesday, according to the statement. A post Tuesday morning by MRA on the 14ers.com site said they were last seen at about 11:30 a.m. Sunday around 13,900 feet on their way to the summit. Witnesses interviewed by the Sheriff’s Office said they’d seen Brightwell and Marcil near the Knife Edge, a 100-foot-long obstacle very close to the summit, Steindler said. “Part of the problem was we could never find anyone who saw them on the descent,” he said. The statement said they may have chose to descend by a different route. Around 12:50 p.m. Tuesday, a CareFlight helicopter based in Rifle and a National Guard Black Hawk helicopter based in Gypsum were deployed to search, according to the statement. The National Guard helicopter spotted the bodies an hour and a half later, and MRA volunteers were able to reach the couple and confirm they were dead, the release states. “We have no idea what happened,” Steindler said. On Aug. 6, 35-year-old Jeremy Shull of Parker fell from the east side of the ridge between K2 and the Knife Edge. On July 15, Jack Lord, 25, also from Parker died when a boulder he was holding gave way on the ridge between Capitol and Mt. Daly. Since 2003, eight people have died climbing Capitol Peak. Hank Carter, an advertising representative at The Aspen Times, knew Marcil and Brightwell before they began dating. “They were fully in love and talking about how they were going to get married,” Carter said Tuesday. According to Marcil’s Facebook page, he moved to Aspen in November 2016. Parker Condit, a close friend of Marcil’s, said that as soon as the couple began dating they were nearly always together. “They got serious pretty quickly,” he said. Dee Humphrey, a Denver resident, said she grew up with Marcil in Vero Beach, Florida, and hung out with Marcil and Brightwell a few weeks ago when they came to her house-warming party. Humphrey said the couple had recently moved in together in Aspen. Marcil was the older brother of Humphrey’s best friend and he looked out for her and her friends and took them out on boats in Florida when she was growing up, she said. He was always in good shape and athletic, and mainly was into water sports, Humphrey said. She said Marcil’s sister told her Tuesday that hiking and climbing in the Colorado mountains was a new hobby for her brother. “It was just in the last few months,” she said. Marcil, who worked this past winter at Surefoot in Aspen, took part in Aspen Strong’s annual hiking event Saturday on Smuggler Mountain before heading out to climb Capitol Peak, said Condit, who also serves on the group’s board. Marcil played tennis at Bucknell University in Pennsylvania and used to work in finance in New York City, Condit said. Brightwell was from Cincinnati, according to her Facebook page.